Actually, the ISEQ’s recent decline has been even more pronounced – since its end-Feb high, the index is down 9.5%. [And we have a similar pattern with the UK’s AIM All-Share, down a whopping 12.7% since its March high. Clearly, the major indices have been performing very differently…I expect to revisit this divergence in my next post]. Despite that, it’s worth highlighting the ISEQ still managed a 3.5% gain for the entire first half – a nice reminder the Irish market seems to enjoy disproportionate first quarter gains nearly every single year. Providence Resources (PVR:LN) stands out from the pack, due to its (somewhat) larger market cap – but its status as Ireland’s Great Black Hope is now rapidly eroding, with no sign of a farm-out deal & every RNS a delay or disappointment at this point (while cash continues to burn…). Sure, there’s plenty of (potential) value here, in terms of reserves & resources – but like its smaller brethren, underlying asset value’s often a pretty notional affair when the cost of accessing/exploiting it requires a daunting level of funding and/or dilution. Then again, what were shareholders expecting…with an O’Reilly at the helm?! What can I say: ‘I’ve warned yiz before..!’ And speaking of, young Tony O’Reilly’s position as CEO is becoming precarious as shareholders count their losses, and Daddy’s 15.5% stake is likely to be sold out from under him. He better bloody scramble: Maybe there’s an unbreakable trust lurking out there that needs to be…um, broken – so he can buy the shares himself & avoid ending up with the highest bidder as his new boss! Finally, it’s interesting to see both Permanent TSB Group Holdings (IPM:ID) & Allied Irish Banks (ALBK:ID) make an appearance. Obviously well-deserved, their valuations (& floats) are ridiculous, but they still offer a clue to (small) investor sentiment. Which is particularly relevant when we see similar sentiment echoed right across the Irish financials – they’re all close to/have already broken key support levels. IFG Group (IFP:ID) is holding up the best (EUR 1.60 is key), I was already prompted to sell FBD Holdings (FBD:ID) (see comments), and Bank of Ireland (BKIR:ID) now looks like it’s broken below key EUR 0.2470-2520 support. All these stocks bear careful watching – particularly Bank of Ireland, which I consider a natural market leader (the exit of Wilbur Ross continues to reverberate here). I’m delighted, of course, to see all of my (non-resource) Irish holdings making an appearance…it doesn’t always work out like this! Total Produce (TOT:ID) continues its relentless march higher – from its formerly absurd under-valuation, less than two years ago. And I’m sure the takeover (sorry, merger!?) of Fyffes (FFY:ID) by Chiquita Brands International (CQB:US) is a nice reminder of TOT’s intrinsic value for a wider circle of investors. Donegal Investment Group (DCP:ID) has only added 10% this year, after a great run in 2013 – but continues to offer substantial upside potential. [Don’t just take my word for it – Argos Investment Managers have clearly been happy to build up an 8.0% stake in DCP this year, presumably around the EUR 6.00 mark]. I guess I’ll claim some credit for the Zamano (ZMNO:ID) gain – the stock immediately rallied 25% in response to my write-up, but has marked time since. In the absence of fresh news/results, ZMNO can still accrue decent gains (it remains very under-valued) – but attaining/exceeding my EUR 0.263 price target will require management to re-define (& deliver on) its operating & capital allocation strategies (again, see my recent post). [We can first look to ZMNO’s AGM & the interims, both are coming up in the next couple of months]. Don’t ask me to explain the rallies in Botswana Diamonds (BOD:LN) or Dalradian Resources (DNA:CN) – call it twitching in their sleep…shareholders will surely wake up to a bad hangover! The relentless decline of Kenmare Resources (KMR:LN) has also been interrupted, this time by a (rejected) share offer from Iluka Resources (ILU:AU). In theory, this bid should be very welcome – KMR’s financial situation’s become somewhat precarious – but I’m pretty sure management (& shareholders?) would rather risk the share price going to zero, than accept any kind of bid at the present time. On the other hand, I’m confident the recommended cash offer for Kentz Corp (KENZ:LN) will be wrapped up shortly. I have to look askance at the gains for Merrion Pharmaceuticals (MERR:ID) & Hibernia REIT (HBRN:ID). It’s almost impossible to ascribe any value to MERR, particularly when you note its negative equity – I suspect private investors have been piling in here hoping for some kind of tax inversion deal… As for HBRN, frankly I’d expect most investors would ultimately prefer Green REIT (GRN:ID) (despite a higher NAV premium) for its commercial property exposure, or Irish Residential Properties REIT (IRES:ID) for its residential exposure. This brings us to DCC (DCC:LN) & Datalex (DLE:ID) – I really have to tip my hat. DCC’s often been unappreciated (but never really under-valued) – in the last two years though, it’s executed as consistently as ever, but has been rewarded with a real surge in the share price. Considering its migration to a UK-only listing last year, plus its FTSE 250 inclusion, you’ve got to wonder if we’re seeing a delayed/sustained reaction..? [And if you look back, Greencore (GNC:LN) seems to have enjoyed a similar surge – despite some good fortune in the past year, the Irish Stock Exchange staff need to wake up & ponder the implications…] Having enjoyed a 142% rally in the past two years, the share price now looks fairly stretched. Datalex has enjoyed an even bigger rally – I suspect a takeover price would be well in excess of my own target price, but the share price currently looks stretched also. Shareholders may face a dilemma here – should they endure some potential near-term share price volatility, (ideally) in return for a substantial increase in the company’s (recurring) revenues & intrinsic value in the next few years? And now, finally, let’s wrap things up with performance: It’s only 6 months, so it doesn’t mean that much – let’s keep it pretty brief & let the numbers do the talking…how did the TGISVP portfolios perform? TGISVP – Beta Portfolio: Assume an investor goes equally long all 26 stocks with positive Upside Potential (e.g. invests EUR 1 in each stock, for a total of EUR 26). The other 54 stocks, identified as neutral (2) or over-valued (52), are ignored. The portfolio return contribution from each stock is simply its Gain/(Loss)%/26. TGISVP – Smart Beta Portfolio: Stocks are chosen on the same basis as the Beta Portfolio, with one twist: All 26 stocks are divided into quartiles, and assume EUR 4 is invested in each top quartile stock, 3 EUR in the next quartile stocks, down to EUR 1 in the bottom quartile stocks (for a total of EUR 66). This preserves diversification, but focuses the portfolio on stocks with the most Upside Potential. TGISVP – Alpha Portfolio: Same as the Beta Portfolio on the long side. But also assume a short overlay of all 52 over-valued stocks, with EUR (1) invested in each stock short. This essentially adds a second inverse Beta Portfolio. 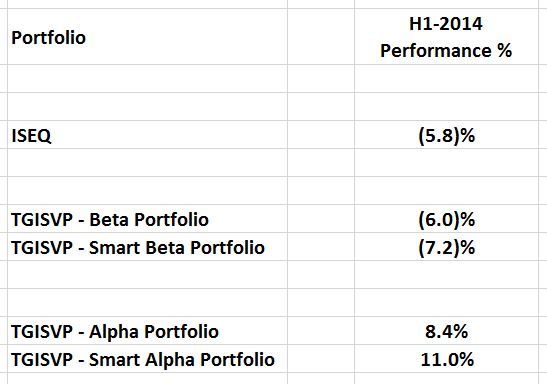 As you might expect, the Beta Portfolios suffered along with the market… For a six month period, relative performance is obviously too close to call – of course, I’d hope to see medium-term out-performance from the over-weighting of stocks in the Smart Beta Portfolio, but in the short-term it’s just as likely to exacerbate losses. Fortunately, the Alpha Portfolios are custom-made to out-perform in this kind of market environment – in fact, at an average +15.6%, this is an astonishing level of out-performance – the largest I’ve seen by far, since I originally started TGISVP! Of course, junior resource stock shorts actually helped out here – in fact, they added about 9% & 12% to the Alpha & Smart Alpha Portfolios, respectively.